At Yellow Nest Hostel Barcelona by Feetup Hostels we have an amazing atmosphere, combing tranquility and security. On our front door we have one of the biggest tourist attractions: Camp Nou. Enjoying all the benefits of avoiding the 'hustle and bustle' of the Old Town we have a large variety of independent stores and great restaurants to choose from! And who can forget the marvelous local Mercat Collblanc, selling the freshest local produce. We´ve got 24 hour reception with staff willing to help you and - of course no curfew and no lockout. In a fantastic zone of the city, where you can socialize, have a rest, eat, drink or simply spend a little time in our Play Room (pool, ping-pong and other games you can play with other guests). After a long day of sightseeing you can enjoy our Netflix room where you choose from a wide selection of movies or chill out on our terrace. Every day we have free walking tours, pub crawls and also our famous paella and tapas nights! Got dirty/smelly clothes?? Dont worry! We can wash, dry and perfectly fold your clothes for only 8 Euros! Our breakfast buffet is available every morning for 2.50EUR. Where you can help yourself to: Coffee, Tea, Hot Chocolate, Cereals, Breads, Juices, Croissants and Muffins. -You don´t know what to do in Barcelona? Our staff will let you know the best places to visit, the best activities to try and how to get there! If you are tired, you are welcomed to have a rest in our huge common area or, listen to music or read a book you like from our collection. If you need any information about the city, our young and friendly staff speaks English and Spanish and will provide you with maps and all the information you will need - sightseeing, transportation, restaurants, nightlife and more. As we are travelers like you, we know what you want out of a hostel and will do all we can to make you feel comfortable and make your stay in Barcelona unforgettable. -Feeling lazy? Why not spend the day relaxing and getting a tan on our incredible terrace garden. - You need to look up something on the internet? Why not use our free computers! Yellow Nest Hostel Barcelona by Feetup Hostels is situated in the neighbourhood of Les Corts, known for its variety of shopping, bars and restaurants. It´s only a short 3 minute walk away from Collblanc metro station. Which is part of the new airport metro connection (Line 9). If you are not coming from the airport we´re a 5 minute walk from Badal metro Station (Line 5) or a 15minute walk from the Sants Train Station the major train station here in Barcelona. With such great connections it only take 15minutes to get yourself to major attractions like the Sagrada Familia or Plaza Catalunya! 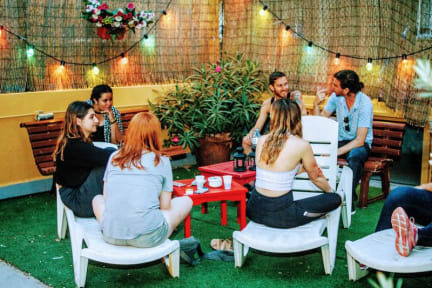 Geweldig hostel met erg vriendelijk personeel, die goed tips konden geven over Barcelona. De badkamer was erg schoon en de bedden lagen lekker. Met de metro ben je binnen 10 minuten in het centrum. Enige minpuntje was dat de wifi op de kamers niet goed werkte, maar beneden in de gezamelijke ruimte deed de wifi het wel goed. Very good. I enjoyed my stay at the Feetup Yellow Nest Hostel. Clean rooms, lots of activities to get to know the city and meet new people, kind and helpful personnel, especially Christina and Eliso 😘 My compliments.